A stronger focus on outcomes will mean a change in how the Public Service designs and delivers services, and in how it approaches problem solving. This will apply across all sectors of the Public Service and will involve a significant cultural shift. The focus must be on more evidence based, longer-term and strategic policy-making and on developing greater integration within the Public Service, with the objective of more strategic and better outcomes for the citizen and business customer. Organisations and sectors must be encouraged and facilitated to work together to deliver the optimal solutions in all areas, irrespective of traditional silos or boundaries, grade structures or delivery channels. 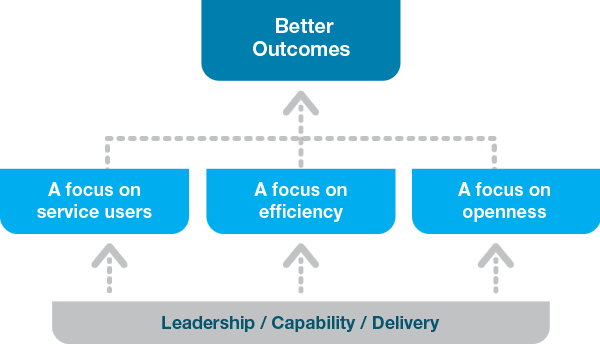 As set out in the diagram below, better outcomes will be delivered through a focus on service users, on efficiency and on openness, underpinned by a strong emphasis on leadership, capability and delivery. Many of these outcomes will be delivered at sectoral level in areas such as health, education, local government and justice, as set out in the Section 3 of this plan. This section goes on to highlight some of the key cross-cutting strategic reforms that will be implemented under each of these headings. The broad strategic direction out to 2020 is set out, with complementary specific time-bound actions over the next three years included in Appendix 1. Better outcomes will be delivered through a focus on service users, on efficiency and on openness, underpinned by a strong emphasis on leadership, capability and delivery.